New MetLife Study shows how employers can take action now and reverse course for 53 million workers. March 25, 2019 — NEW YORK–(BUSINESS WIRE)–For the past 20 years, employers have been fixated on two major workforce impacts—preparing for the waves of boomers set to retire and creating a dynamic workplace to attract and retain the influx of millennials. While focus has been elsewhere, Gen X — a group now ages 38 to 53, who accounts for a third of the U.S. workforce, or 53 million people1 — has been overlooked. According to MetLife’s 17th Annual U.S. Employee Benefit Trends Study (EBTS), released today, the impacts of this neglect are real: Gen X employees not only feel significantly underappreciated at work and engage at lower rates than millennials, they also lag both boomers and millennials in key financial security indicators. Across all demographics, the study found employees name personal finances as their number one source of stress, however just 59 percent of Gen X workers are confident in their finances, compared to two-thirds (67 percent) of millennials and 65 percent of boomers. Gen X workers are also the least likely to have a savings cushion of three months of salary – just over half (53 percent) have sufficient savings, compared to 58 percent of millennials and 60 percent of boomers. This, combined with the fact that nearly half (48 percent) of Gen X employees report living paycheck to paycheck, puts this generation in the danger zone when it comes to preparing for the unexpected and planning for the future. Given their financial pressures, it’s not a surprise the study revealed Gen X as the least happy generation of employees at work—just 68 percent of Gen X workers report being happy at work, compared with 75 percent of millennials and 74 percent of boomers. Contributing to Gen X unhappiness is that only 54 percent of Gen X workers feel empowered at work and 62 percent feel respected in the workplace. The importance of employee happiness should not be overlooked by employers – 90 percent of happy employees say they are loyal to their employer. Although employers attempt to show employees appreciation through many channels, Gen X workers are not feeling the impact. Relative to their millennial colleagues, Gen X workers believe employers are not providing them with timely promotions, exposure to senior leadership, and meaningful work projects. Employers, though, don’t see this as a problem – only 18 percent of employers believe a top challenge they face is creating an inclusive environment for all generations. This issue has reached its tipping point – employers can no longer overlook Gen X, especially since they are the most likely generation to say they will never retire and may remain in the workforce for the next 30 or more years. Nearly one in five (18 percent) Gen X employees do not plan to ever retire, compared to 14 percent of millennials and 12 percent of boomers. One reason could be that more Gen X workers (55 percent) are behind on their retirement savings than millennials (49 percent). 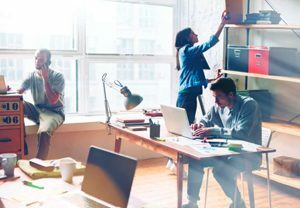 While employers have focused on providing resources to millennials and boomers, the employees likely to work longest are Gen X – and employers need to understand how to keep this group engaged, happy and productive. Employers should start by looking at their benefits offerings. When asked to decide between better benefits or more flexibility, 57 percent of Gen X workers chose better benefits, compared to 48 percent of millennials. Benefits such as paid leave, financial wellness programs, legal plans, supplementary health and disability insurance provide resources as well as the necessary financial security to prevent long-term hardships. Offering financial wellness tools can help all employees, not just Gen X. Eighty percent of all employees want financial wellness programs available to them through work, yet just 20 percent of employers offer this benefit. In addition to their benefits, employers should also look at the training they offer employees. Roughly two in three Gen X workers say their employers do not provide people management and development skills training (68 percent) or learning opportunities to adapt to technology innovations (65 percent), yet only 29 percent of employers consider upskilling current workers a challenge for them. This indicates employers may not fully understand the desire from employees for more educational opportunities. MetLife’s 17th Annual U.S. Employee Benefit Trends Study (EBTS) was conducted in October 2018 and consists of two distinct studies fielded by Engine Insights – a practice area of Engine, a data driven marketing solutions company. The employer survey includes 2,500 interviews with benefits decision makers and influencers at companies with at least two employees. The employee survey consists of 2,675 interviews with full-time employees, ages 21 and over, at companies with at least two employees. Engine is a new kind of data-driven marketing solutions company. Powered by data, driven by results and guided by people, we help our clients make connections that count—leading to bottom line growth, an inspired workplace and business transformation. With global headquarters in New York and 17 offices across North America, the UK, Europe and Asia-Pacific, Engine offers clients a vast range of marketing solutions—including insights, content, distribution, data and technology. Find out more at enginegroup.com or follow us @Engine_US. « So, How Effecively Are You Engaging Your Clients?